Bicycle enthusiast with some tweed in your wardrobe? If so join in the fun at the Melbourne Tweed Ride, starting this year for the first time at the Grainger Museum. Bring your tweed bicycle helmet. 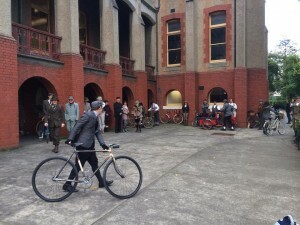 The Melbourne Tweed Ride is a metropolitan bicycle ride with a bit of style. The participants take to the streets in their well-pressed best and cycle through the city’s iconic landmarks. Refreshments will be served to participants at the Museum before departure.